Precious metals rose Thursday, extending their repeated movement of lower and then higher closings that started on Monday. Gold prices rebounded from their lowest close of the month. Gold for June delivery gained $7.40, or 0.6%, to close at $1,194.30 an ounce on the Comex division of the New York Mercantile Exchange. Gold prices traded from $1,183.60 to $1,195.40 and are down about 0.7% since Friday. On Wednesday, they marked their weakest settlement price since March 31. 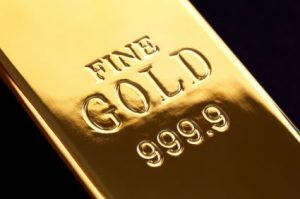 "Gold prices ended the U.S. day session higher Thursday, on some short covering and perceived bargain hunting after recent selling pressure," Jim Wyckoff, a senior analyst at Kitco Metals Inc., said in a report. "The key ‘outside markets’ were fully bullish for the precious metals on this day, as the U.S. dollar index was sharply lower and crude oil prices were sharply higher." Silver for May delivery settled up 3 cents, or 0.2%, to $15.83 an ounce. Silver prices ranged from $15.71 to $15.92. They declined on Wednesday by 1.3% and are off 2.5% since Friday. July platinum rose $7, or 0.6%, to $1,136.70 an ounce, trading between $1,126.40 and $1,139.70. Palladium for June delivery jumped $14, or 1.9%, to $769.90 an ounce, ranging from $755 to $776.75. Palladium fell $5, or 0.7%, to $761 an ounce. United States Mint bullion sales were unchanged Thursday as of 3:17 PM ET. The table below offers a listing of U.S. Mint bullion products shows the number of coins sold during varying periods. Products with an asterisk (*) are no longer available.